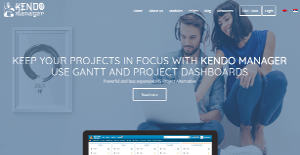 Kendo Manager is a project management solution entirely based on Gantt charts and project dashboards, and built to help managers and teams centralize project details and run multiple projects with ease and efficiency. The system delivers agile project management capabilities and other features, including collaboration, budgeting, issue tracking, learning and support, resource management, task management, and reporting among others. Created for small and medium-sized businesses, Kendo Manager provides companies, teams, and managers with a platform that makes communication, collaboration, and tracking the status of every project in every moment a breeze. Complete and simple, it is an ideal project management solution for small to mid-sized businesses, helping them realize their projects faster and encourage cooperation among team members in any situation. Kendo Manager gives your small or medium-sized business an Agile Project Management platform that offers significant flexibility that allows you and your team to cover a variety of projects in various fields, from administration teams to NGO projects, marketing projects, software development projects and many more. With Kendo Manager, you get an enterprise-level project management software for a very affordable price that fits your small budget and tailored for small to medium-sized project teams. While Kendo Manager functions as a web-based software, it also gives you the option to install it on your own infrastructure as a project server and can service an unlimited number of users. Being a web-based platform, Kendo Manager allows you to perform project management tasks even on the go. You can manage your resources and personnel, view and set schedules, create and implement budgets, plan projects, and communicate with other members of the team and your clients from your mobile device. When you want to do project management the traditional way, Kendo Manager lets you do that too. Classical task list and Gantt chart is also supported by the software. With three levels of managing projects (Overview, My Dashboard, and Dojo), Kendo Manager is a project management solution that gives you total control over all your project tasks and project activities. What Problems Will Kendo Manager Solve? First case: Control and monitoring of multiple projects in real time. Project managers are often dealt problems with overviewing several projects at the same time. With Kendo Manager, managers can monitor all active projects and all active project processes from a single dashboard. All overviews that are important are easily viewable, including project activities, problems and changes in the project, risks, key events, total costs and total time spent for the realization of company’s projects. Time and money should be managed well. Kendo Manager makes it easy for users to track budget changes and/or adjustments, and whether or not they are reaching critical levels. The software allows project stake holders and project managers to see how are the costs distributed. As one of the enterprise solution options, Kendo Manager provides the ability to control multiple projects from one place. This is not something that all less expensive project management software offer, and often it is considered to be a big time saver. Every enterprise has different needs and requires a software that can be personalized for their size, kind of employees and clients, and the specific industry they are in. For these reasons, no system can proffer perfect tools out-of-the-box. When you try to find a software app, first be sure what you need it for. Read some Kendo Manager reviews and ask yourself do you want basic features or do you need sophisticated tools? Are there any industry-specific tools that you are seeking? Obtain the answers to these queries to help your search. There are multiple elements that you need to reflect on and these include your budget, specific business requirements, your company size, integration needs etc. Take your time, try out a few free trials, and finally select the app that provides all that you need to enhance your company competence and productivity. How Much Does Kendo Manager Cost? We realize that when you make a decision to buy Agile Project Management Software it’s important not only to see how experts evaluate it in their reviews, but also to find out if the real people and companies that buy it are actually satisfied with the product. That’s why we’ve created our behavior-based Customer Satisfaction Algorithm™ that gathers customer reviews, comments and Kendo Manager reviews across a wide range of social media sites. The data is then presented in an easy to digest form showing how many people had positive and negative experience with Kendo Manager. With that information at hand you should be equipped to make an informed buying decision that you won’t regret. What are Kendo Manager pricing details? What integrations are available for Kendo Manager? The best aspects are that this product is easy to use. If you need more information about Kendo Manager or you simply have a question let us know what you need and we’ll forward your request directly to the vendor.